Your Cumberland County Team...And Beyond. The Aughenbaugh-Turnbaugh Home Group serves all of Cumberland County and the surrounding counties in Central Pennsylvania. 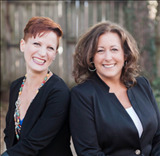 Beth and Amy have years of real estate experience helping home buyers and sellers achieve their dreams! From exceptional marketing to personal service, this duo of high-energy Realtors are the agents of choice. The team looks forward to meeting you and learning more about your specific needs. When you’re ready to get started, visit www.athomeinpa.com and search all homes for sale in Central PA or learn more about Beth & Amy’s proven marketing strategies. Let’s talk soon! My goal and top priority is to ensure your needs are met while providing you the utmost in customer care & education, while maintaining your confidentiality. My professional expertise will seamlessly guide through the entire process guaranteeing a positive & rewarding experience. I am reliable, proactive, supportive& hands-on with my clients, consistently building lasting relationships through my skills and knowledge. Hello to all the home buyers and sellers out there! I am a Central PA native and LOVE, LOVE, LOVE working with people that want to buy and sell real estate in this area. I am a fast paced, hard-working, caring and compassionate Realtor that can make your experience in the real estate market a positive and uplifting experience. Almost all of my clients I consider friends and I do my absolute best getting what each individual needs and wants in each transaction. I currently live in Wellsville, PA and have an amazing family, with two children and one step kiddo. I have a fabulous husband who keeps me laughing and supports my business wholeheartedly. I can see myself in my 80's still doing real estate and making one of the most important decisions people make in their lives, successful and memorable ones! With over 20 years of experience in sales, Marilee prides herself on the high level of care that she gives to her customers. This means that she takes the time to get to know you and what is important to you in the process. Additionally, she will communicate with you every step of the way to ease any stress in the home buying or selling process. Marilee is an expert in the local area, understanding the ever-changing market. This knowledge helps to properly price a home to sell or negotiate the best price for the client. There is nothing better than opening the door to your new home the first time. The feeling that this is now your home is what inspired me to go into real estate. My goal is to help you find your home, whether it is your first home, time for a larger home or you are ready to downsize. Looking forward to working with you.